With much larger vehicles, heavier loads, and long driving distances, semi-truck drivers have to be extra cautious on the roads. Unfortunately, there are still many commercial truck accidents each year. 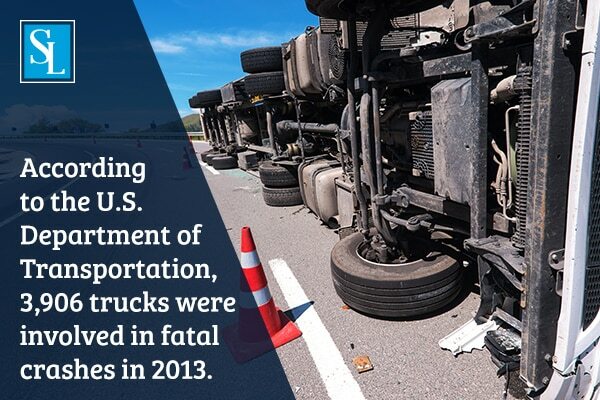 The U.S. Department of Transportation shows that in 2013 alone there were 3,906 trucks involved in fatal accidents. So, when sharing the roads with the big rigs, it’s important to know about the types of accidents that tend to occur. Let’s take a look at a few common types you should know about. Since semi trucks are larger and carry heavy loads, they weigh much more than the average car. And because of their weight, it takes longer for them to slow down and come to a stop. So when they need to stop quickly, such as when a car cuts them off, they’re not always able to stop in time, resulting in a rear-end collision. This type of accident can cause significant property damage and injuries. With this in mind, it’s important to remember to give plenty of space between you and a semi truck when merging into their lane so they don’t have to slam on the brakes. Similar to rear-end collisions, underride accidents result when a smaller vehicle becomes lodged underneath the truck’s trailer. This can happen when a truck stops quickly and the vehicle behind the truck is following too closely and can’t stop in time. This type of accident is one of the most fatal commercial truck accidents. It’s important to always give plenty of distance between you and the semi truck you’re following to avoid this type of accident. Sometimes when a truck driver has to brake fast, the trailer slides outward and creates a 90-degree angle with the cab, which is referred to as jackknifing. This type of accident is common when driving conditions are poor and the truck can’t stop properly. With the trailer jackknifing, the driver essentially has no control over the truck, which can result in deadly accidents. Commercial truck accidents of this type can also turn into rollover accidents, where the truck rolls over on its side. Unfortunately, there isn’t much drivers can do in these situations. Drivers need to be careful when sharing the road with commercial trucks. If you’re ever in an accident with a semi truck, it’s important to contact a lawyer as soon as possible. Lawsuits that result from commercial truck accidents can be complex, and working with an experienced attorney can help ensure that your case is as strong as possible. So if you’re looking for a commercial truck accident lawyer, contact the Steigmann Law team for a free consultation.